« Rosie Huntington-Whiteley vs. Minka Kelly: Who Wore Flared Jeans Better? Showing once again her flare for fashion, earlier this week Beyoncé Giselle Knowles-Carter shared an interesting outfit on Instagram. The 31-year-old entertainer posed for the cameras in red grunge style flannel R13 shorts styled with a grey Gypsum Upton bodysuit. While barely visible in the photo, she also sported a pair of studded platform booties by Giuseppe Zanotti. 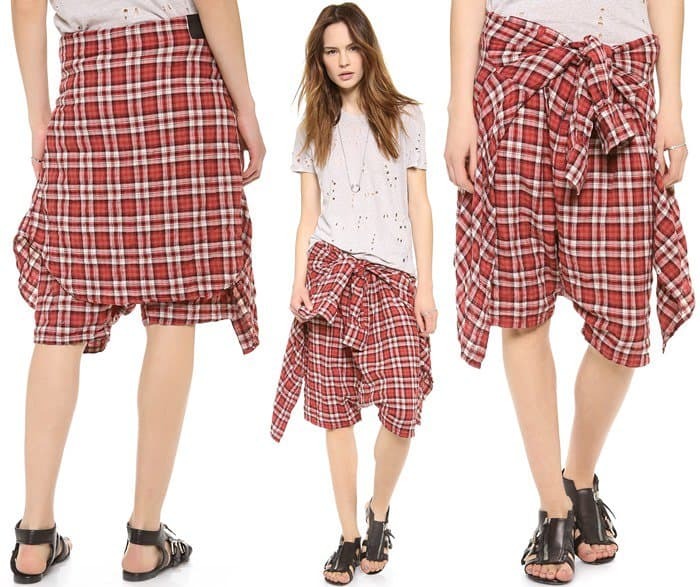 While her Italian-made plaid shorts have sold out at Shopbop, we hope they’ll restock soon. The cotton shorts feature layered flannel in red, white, and black plaid. A trompe-l’oeil long sleeve shirt is tied at waist in matching plaid. Would you wear them?